I'm going to do a YouTube video on my thoughts for the 2011 Royal Rumble, hopefully Saturday night. Chad has written up his thoughts. What are your's? In preparation of Sunday’s 40 man Royal Rumble Pay Per View, I checked out wwe.com to see exactly how many guys are on the roster. Not counting guys that are injured, there are currently 44 guys listed on the roster pages. If there are no surprise returns or surprise entrants, if you’re one of the 4 guys that aren’t in the rumble, you might want to start reaching out to other promotions about possible interest in your services because your name is probably going to come up on the next rounds of cuts. As of Friday afternoon there were 28 announced guys for the Rumble. They are, Alberto Del Rio, CM Punk, Cody Rhodes, Daniel Bryan, Darren Young, DH Smith, David Otunga, Drew McIntyre, Ezekiel Jackson, Heath Slater, Husky Harris, Jack Swagger, John Cena, John Morrison, Justin Gabriel, Mark Henry, Mason Ryan, Michael McGillicutty, Primo, R-Truth, Rey Mysterio, Sheamus, Ted DiBiase, Tyason Kidd, Wade Barrett, William Regal, Yoshi Tatsu and Zack Ryder. The remaining 16 roster members are: Big Show, Chavo Guerrero, Chris Masters, Curt Hawkins, Finlay, Joey Mercury, JTG, Kane, Kofi Kingston, Trent Barreta, Tyler Reks, Jay Uso, Jimmy Uso, Michael Tarver, Santino Marella, and Vladimir Kozlov. Of those guys, I believe Big Show, Kofi Kingston, Kane and Chris Masters have either been mentioned as being in the Rumble or have competed in the mini-rumbles on Raw and Smackdown which should mean they’re in the match. That brings the total to 32 entrants. JTG, The Usos, Michael Tarver and the Tag Champions Santino/Kozlov will probably be in the match as well. That’s 38 guys. I’d wager a bet that Joey Mercury, Trent Barreta, Curt Hawkins and Finlay are the four most likely to not be included in the match. Tyler Reks, and Chavo Guerrero are the wild cards as far as getting a PPV pay day. Then you have the guys who are on the injured list. That list is comprised of Christian, Triple H, Great Khali, Skip Sheffield, Goldust, Evan Bourne and Undertaker. I read Goldust isn’t expected to be ready for a return until June. Not sure what Skip Sheffield’s status is at this time. I can’t see WWE having too many people return in the Rumble match. I’d say there probably won’t be, or shouldn’t be, more than two guys returning. I’d say the most likely returns are Triple H and Evan Bourne or Christian. I don’t see Evan Bourne being a big enough star to warrant being a surprise entrant. And if there are any other surprises, they will probably be used to excite the crowd instead of being someone who’ll be a serious contender to win the Rumble. 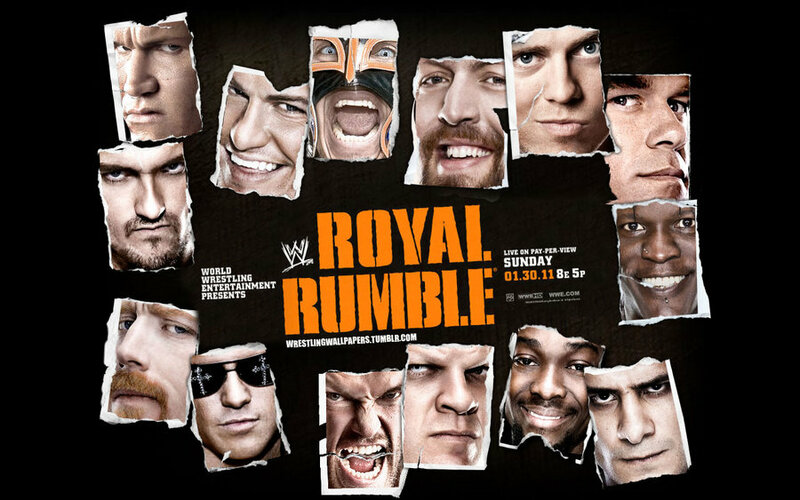 Now with all that out of the way, who do I see as winning this year’s Royal Rumble? I have to give WWE credit. This is probably the most unpredictable Royal Rumble since the winner started getting a title shot at Wrestlemania. There are no clear cut Mania title matches on the horizon. Unless they have a surprise winner who then gets cheated out of or loses his Wrestlemania match, it’s probably safe to eliminate at least 30 of the participants. I’m going to give pros and cons of the top 10 contenders. Alberto Del Rio: PRO: Has been positioned as the future of Smackdown ever since he first showed up and appeared to be on the path to championship gold. Con: Has been in a pointless feud with R-Truth for the past month. His push has seemed to stall. CM: Punk: Pro: Leader of the New Nexus, may have other guys watching his back. Con: A Mania match of Nexus vs Corre or Punk vs Wade Barrett would make more sense. John Cena: Pro: He’s John Cena. Con: Doesn’t need to win to position himself into a title match. Sheamus: Pro: Former WWE Champion. Current King of the Ring. Winning would move him back up into the main event. Con: Anticipation of Triple H’s return seems to point to another round of Sheamus/Triple H matches. Wade Barett: Pro: Way to re-establish him as a major star after the Nexus angle fizzled due to constantly ending up on the losing end with John Cena. Con: See CM Punk. Triple H: Pro: WWE loves to have a returning superstar win the Royal Rumble. Con: Doesn’t need the win to reclaim his spot at the top of the card. Christian: Pro: Same as Triple H. Plus a Christian vs Edge title match would make for a good Wrestlemania match. Con: Hasn’t been presented as a main event caliber wrestler since his return to WWE. Drew McIntyre: Pro: The Chosen One. Would help give him some credibility. Con: In the middle of a relationship angle with Kelly Kelly. Not really ready for a Main Event match. David Otunga: Pro: His marriage to Jennifer Hudson could produce lots of publicity for WWE. Con: He’s David Otunga. Even though he’s presented as the number 2 guy in Nexus, fan reaction places him at #4. John Morrison: Pro: Has been rising through the ranks over the past few months. A victory could put him over the top in the fan’s eyes. Con: His title match with The Miz Is that a sign WWE management doesn’t see Morrison as main event material at this time? Out of those 10 guys, I would like to see Christian win the rumble and go on to main event at Wrestlemania. But I really can’t call a winner this year. I do know I’ll be watching with anticipation to see who is the last man standing in the shadow of the Wrestlemania sign.